The Engines is one of the many groups formed by the musicians of the ever creative and restless Chicago jazz scene. Here we have: Dave Rempis (saxophone), Jeb Bishop (trombone), Nate McBride (bass), and Tim Daisy (drums). While all are involved with other groups and personal projects, the group — originally a trio, then added Bishop later on — has been a working group for about a decade, influenced by music created in the 60’s by the AACM, and adding to it their own aesthetics. 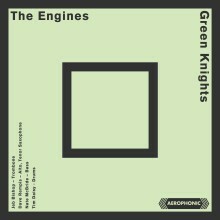 Green Knights is a 2012 live concert at the Green Mill Cocktail Lounge in Chicago, containing six long tracks that are a mixture of post hard bop and free improvisations. “Going Dutch/Spark/Cascades/Tilt” is a massive 33 minute work, running through a myriad of post 60’s jazz music, from the Art Ensemble like improvisations, to the atmospheric free jazz, to free bop, to Ornette Coleman influenced music. The quartet moves from one form to another with ease, and their improvisational skills are very good; the music never lags during that long duration. “Looking” is comparatively the shortest track at 8 minutes, a gentle ballad that showcases Nate McBride with a long solo, and Dave Rempis playing reminiscent of early Jackie McLean. “Strafe/High and Low” is a medium fast tempo with powerful playing by Rempis and Bishop, a searing front line of horns augmented with the hypnotic rhythm section of McBride and Daisy. “El Norte/Strafe/Gloxinia/Cocktail Song” is another long track, 29 minutes plus, beginning with sharp and punctuated latin rhythms for “El Norte,” with bouncing tomboys accents by Bishop and an exciting solo by Rempis. It steadily progresses to a faster pace, to where the horns just about explode in their ebullient expression. At the tail end to this track the high energy is tempered by a moody and sonorous tone. “Looking High and Low” is another gorgeous ballad, smooth yet slightly dark, with Bishop and McBride having long solos. “Planet/Cascade/Tilt” has another fast paced latin rhythm that moves quickly towards swinging hard bop, with extended free flowing improvisations by Rempis and Bishop. Green Knights is a lively, highly creative live concert by veterans of the modern Chicago jazz improv scene.